Town Week opening features afternoon of Culture. Little Ambeka Providence could have been alive today, had it not been for a horrific accident last year. On September 10, 2016, a 21-year-old driver slammed into the vehicle in which the child and her mother, Abiola Trotman, were passengers. Ambeka was flung through the window of the vehicle and onto the roadway on Sheriff Street. She died on the spot. Like this little girl’s family, the relatives of 126 persons are still mourning their deaths following road accidents in 2016 while 43 lost their lives so far for this year. In light of the increasing death toll, the Guyana National Road Safety Council (GNRSC) is trying to adopt new measures to prevent these tragedies from occurring in a country with a small population of approximately 700,000. Only recently, the ‘White Night’ campaign was launched across the country to educate the public on safe driving. Additionally, to ensure that experienced and responsible drivers are on the road, GNRSC is advocating for all drivers to be retested on renewal of their licences. Coordinator of the GNRSC, Ramona Doorgen said that the council has already started discussions with the Guyana Police Force (GPF)’s Traffic Chief and the Minister of Public Security and is in the process of drafting a proposal. “GNRSC is advocating for everyone who goes to renew their licence, to show that they were retested (present a retest certificate),” Doorgen said. The proposal is to have drivers redo certain aspects of the exam—both theoretical and practical. Kaieteur News understands that the council has been calling for such a system since 2008. Doorgen pointed out that a survey done in November last, with 60 drivers who operate mini buses, hire and private cars, showed the need for such a system to be established. Initially, there were calls for bus drivers do redo certain aspects of the practical examination on renewal of licences, since it was believed that they were the main culprits of reckless driving. However, based on statistics compiled by the GPF’s Traffic Department, it was revealed that it was private car drivers who caused the most deaths. 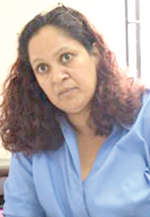 Last month, the Minister of Public Security, Khemraj Ramjattan said that the process of suspending drivers who were charged with dangerous driving had begun. As a result, bus driver, Alpha Felix had his licence suspended, following a four-vehicle crash in West Coast Berbice in which several children were injured. Statistics released last January by the Police Traffic Department revealed that the nation lost 1, 289 citizens to road fatalities between 2007 and 2016. The victims during this ten-year span included 133 children, 161 mini-bus passengers, 95 passengers in cars, and 143 drivers. Those statistics also revealed that 169 perished in 2007, which had the highest number of fatalities. Thirty children, 63 motor cyclists, 30 pedal cyclists, and 32 minibus passengers were among the victims. That was followed by 2014, with 146 deaths, including 16 children; 2016, with 128 deaths, including 12 children; 2015, with 126 fatalities, including 15 children, and 2010 and 2011, which both recorded 115 deaths. 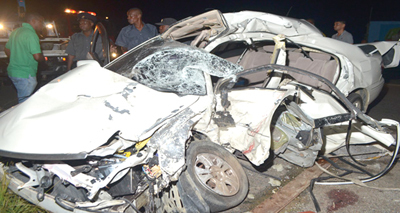 In July, 2011, five people perished after a speeding and overloaded minibus suffered a blowout and overturned on Homestretch Avenue. > New Amsterdam gets major facelift and transformation.